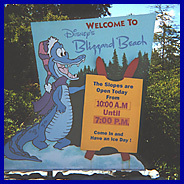 It is said that Blizzard Beach was created when a freak snowstorm hit the highest peak in Florida. A ski lodge, with all the trimmings, was created – and voila – Florida’s answer to winter fun was born. But as the Florida sun beat down on the snow-capped mountain, the snow began to melt and run down Mt. Gushmore. The rest is history. After hitting the theme parks around Orlando, Blizzard Beach was a welcome respite. It felt like home. Snow capped mountains, icicles, snowmen, chairlift, slalom gates, and floating icebergs, ahhhh winter in a bathing suit, what could be better than that? Well for one thing – the thrill factor. Blizzard Beach has lots of that. Mt. Gushmore, at 120’ high, has got the world’s tallest, fastest, longest, free fall speed slide, the Summit Plummet. And it’s fast. Ask any of the kids lined up for the thrill. My family preferred the somewhat slower (?) Slush Gusher body slide and the Snow Stormers, a slalom gate slide with lots of turns. Big fun. Big Kids and Fearless Adults: Mt. 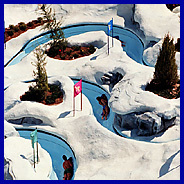 Gushmore for sure, Toboggan Racers, Snow Stormers – with a break for a frozen ice – and then meet back at Melt Away Bay, the one acre wave pool of melting snow. Medium Kids: Blizzard Beach Ski Patrol Training Camp with its ropes, swings and floating icebergs, makes for a great place for Mom and Dad to park it for some lounge time. The T-Bar drop was especially appealing. Meet back at Melt Away Bay. Little Kids: Tike’s Peak with its snow castle and mellow slides is the perfect spot for toddlers. They can go on their own and spend some down time splashing amid the numerous fountains. Lots of lounge chairs here too. Meet back at Melt Away Bay. Family unites at Melt Away Bay for some wave time. Then it’s on to a chair lift ride to the top for Teamboat Springs, the world’s largest family raft ride down a twisting course. Even the toddlers will like it. One big raft for everyone! Smile for the camera - they’ll get you on film. Blizzard Beach has the usual well thought out Disney appeal. We loved the ski resort signs, puns and all of the melting ice along walkways for burning bare feet. There were several places for an affordable lunch, many covered with umbrellas to keep out the heat. As a matter of fact, there was lots of shade, with many parents taking advantage of it for sleeping babies and tired tots. Park personnel were courteous and informative – there was even a trail map for directions! TIPS: Arrive early, as the park can get crowded. Bring lots of sunscreen, water and towels. LOCATION: 1801 West Buena Vista Drive, Lake Buena Vista, Florida 32830. LODGING: There are literally hundreds of motels, hotels and rental homes around Orlando. If you are planning to stay for a while we recommend renting a house or villa. Prices start as low as $59 a night and you get a full kitchen, bedrooms, washing machine, and all that stuff we hate to leave behind.